After much speculation, Simon Gagne was finally traded to Tampa for defenseman Matt Walker and a draft pick. There may be another deal to come, because now we have eight defensemen and are still thin at forward. Yes, we signed Zherdev who should score some goals, but we lose goals in trading Gagne. Meanwhile, goaltending has not been solved and can someone tell me why we signed Jody Shelley for three years at $1.1 million per? Homer has improved the defense but there are still holes on this team. At least Walker is a right handed shot so we finally have a defenseman who doesn’t have to go to his backhand to handle the puck as it comes up the right boards. I’ll withhold judgment on the off-season moves until the season starts. Antii Niemi is going to arbitration with Chicago. They may not re-sign him. Will the Flyers jump in and try to grab him? All speculation is centering on Simon Gagne. Many think he’ll definitely be traded but not until the Kings know if they’re signing Ilya Kovalchuk or not. More recent rumors have Gagne and possibly Braydon Coburn going to Toronto for defenseman Tomas Kaberle and possibly a goalie prospect. This would give the Flyers about $3.5 million of extra cap space, which they do need. The Flyers announced the rumored signing of right wing Nikolai Zherdev to a one year contract. 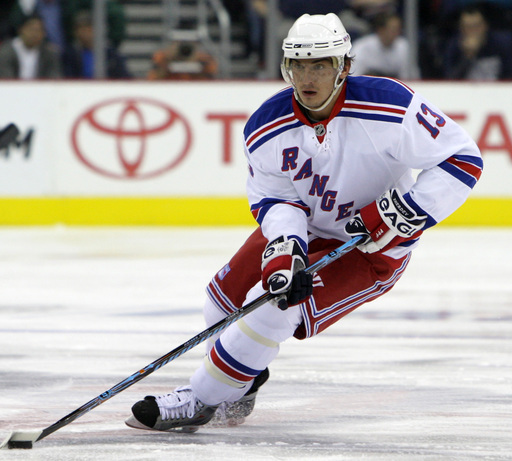 The former Ranger and Blue Jacket was signed at $2 million. Questions: Gagne Going or Staying? Zherdev? Carter? Now we’re hearing that Simon Gagne says he has not waived his no-trade clause. Meanwhile, the signing of Nikolai Zherdev seems all but done but no announcement. If Zherdev wants $4 million per year as reports indicate, the Flyers would have to move someone like Gagne ($5 million per year). But can someone answer this: Why trade one winger just so you can sign another? Healthy, Gagne should score more than the 25 or so goals per season that Zherdev has produced, plus he’s good defensively and familiar. Zherdev is known for being lazy and lax defensively. And for $4 million per year? How would this be an improvement? It seems to me if you’re going to bring in a winger (which the Flyers do need) and you need to make cap space to do so, fine, then trade a center. We have more centers than we need and none (except maybe Mike Richards) can be moved to wing effectively. Jeff Carter makes $5 million per year, will be a free agent after next season, is lackadaisical and not particularly strong defensively. Yeah, he has a great wrist shot but how many times does it go wide or get blocked? Way more often than it goes in the net. Carter (perhaps and a Carcillo) might land you a #1 goalie and still leave room to sign/acquire a right wing. Carter should go, not Gagne. Flyers to Sign Nikolai Zherdev? Many reports are indicating that the Flyers are close to signing right wing Nikolai Zherdev, a former Ranger and Columbus Blue Jacket who played in the KHL last season. Right now, Zherdev’s agent has said the signing is all but done and will be announced Wednesday. Zherdev, who is Ukrainian (not Russian), was a first round pick (fourth overall) of Columbus in 2003. His last two seasons in the NHL (’07-’08 and ’08-’09) he scored around 25 goals and 60 points in each. Good offensively and 6’2, 200 lbs., Zherdev is known for being inconsistent and lax defensively and has been reported to have had some attitude issues. However, the Flyers need to sign a right wing who can put up some numbers. Hopefully, they won’t overpay because they still have a couple players (Darroll Powe and Aaron Asham) that they should sign. Can we judge the Flyers’ off-season moves yet? I don’t believe they’re finished. With Gagne being asked to waive his no-trade clause, something else is brewing. So far, they have upgraded their defense but have not done anything about the goalie situation and are in need of a right wing. You could argue that it wasn’t necessary to take on the $4 million per year contract of Andrej Mezaros (and maybe they could have had a better defenseman in Anton Volchenkov for just half a million more). They have the most expensive defense in the league now and only about $1 million in cap space after Riley Cote is let go as expected. With five centers (Richards, Carter, Briere, Giroux, Betts), none of whom are really effective playing wing, it seems to me that moving a center would be logical. Carter makes $5 million per year, seems aloof and lackadaisical, and will be a free agent after this coming season. Trading Carter should help the Flyers to add the goaltender and right wing that they need. Dan Carcillo filed for arbitration after he rejected the Flyers offer of a mandatory 5% salary increase. If the past is any indication, “Carbomb” is history. The Flyers don’t like it when players file for arbitration, often trading them shortly afterward. The Flyers may have anticipated this when they signed free agent Jody Shelley. They also have to decide if they’re going to re-sign Aaron Asham and the Shelley signing may be an indication that Asham is on his way out, too. Signing Shelley is still puzzling to me, especially at $1.1 million per year. I think certainly Asham and possibly Carcillo bring more ability than Shelley. Why not re-sign Asham rather than overpaying for Shelley? No wonder Carcillo wants to go to arbitration – he looks at Shelley, a two goal scorer last season, getting this money and he thinks “Last season I scored 12 goals and played some on the top line, I should be worth that kind of money, too”. He has a point. On the other hand, Carcillo takes undisciplined penalties, gets no breaks from refs, and was scratched in the finals. This will be brought up during arbitration when often things are said that cause bad feelings. So look for Carcillo to be traded and Shelley to take his place. However, dumping Asham and Carcillo and replacing them with Shelley seems like a downgrade to me.